I really do not know why my family keeps saying, every Christmas, that we are not doing the gift thing. "Only for the kids" says my sister. Ok cool, I agree with that. Philisophically speaking, I'm totally against the way capitalists have brainwashed ordinary people into believing they are obliged to spend their slave-earnt cash on absolute crap that no one wants when it ends up in the cupboard, collecting dust on a shelf, in the garbage, or regifted (actually, I rather like the idea of regifting, if people Insist on the ridiculous ritual of gift-giving, passing it forward seems a reasonable solution). And of course, gullible me believed my sister as she was even more believable than last year. So, I only got some little presents for our family's six young children. And lo and behold, what happened? Yup, we got some gifts, the childless couple. Grrrr. We even got some gift vouchers from the department store I actually occasionally manage to get myself to, so it wasn't an impractical gift and will be used of course, but its the principle of the matter, isn't it. No wonder everyone has money problems, when they buy stuff they do not need to. And my sister gave us a bottle of wine, just a cheap brand that we drank. A bottle of wine is a good gift to give a couple, as it can be shared, and its less than $10. But my sister can not afford frivolity, despite that fact she often indulges in it. The silliest gift we got were a box of three pretty glass ornaments to hang, decorative things with no practical use whatsoever and no easy way to actually hang them up on ... something? They are meant to be a Christmas decoration, although would look nice hanging in a window to catch the light, but we have those silly flapping vertical blinds here so there's no where to hanging pretty things in the windows. A perfect candidate for next years regifting! 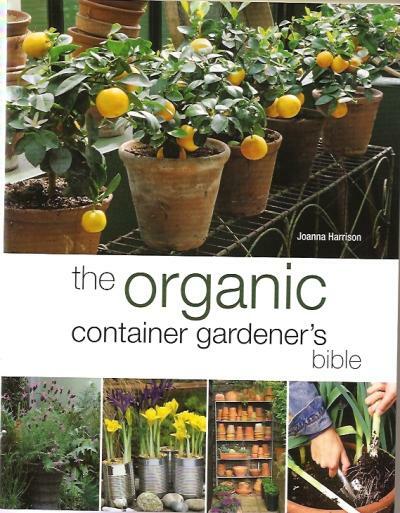 The best thing we were given this year was a very thoughtful and practical book called 'the organic container gardener's bible' as we have a modest container garden which is finally starting to look as if it might thrive in our small courtyard. We think this book caught our eye in the bookstore when we were hanging out there a few months ago and it has some very helpful pages in there for us. We were just talking to David's mum recently about how if gifts are to be given, it should be something that makes you think of the person as a useful gift to give them, at any time of the year, and not the other way around, when you go to the shop frantically looking for something to give Relative XYZ and end up grabbing some silly thing. And that reminds me, it was Beverly's 60th birthday on New Year's Eve - sweetheart, did you ring your mother? Anyway, my mum must have thought this book was perfect for us and its proven to be a good read with some good advice and tips for our little garden. And next year? Well. Note to self - don't believe my relatives when they try and say 'no gifts for Christmas'! They are lying! Next time I will indulge in the silly ritual of gift giving but it will be thoughtful and cheap! Like homegrown and fruiting chilli plants, of which if they all survive we have way too many, bars of pretty soap, recycled pencils for the children with new books, stickers and cheap toys ... and bottles of cheap wine! Hoorah! !